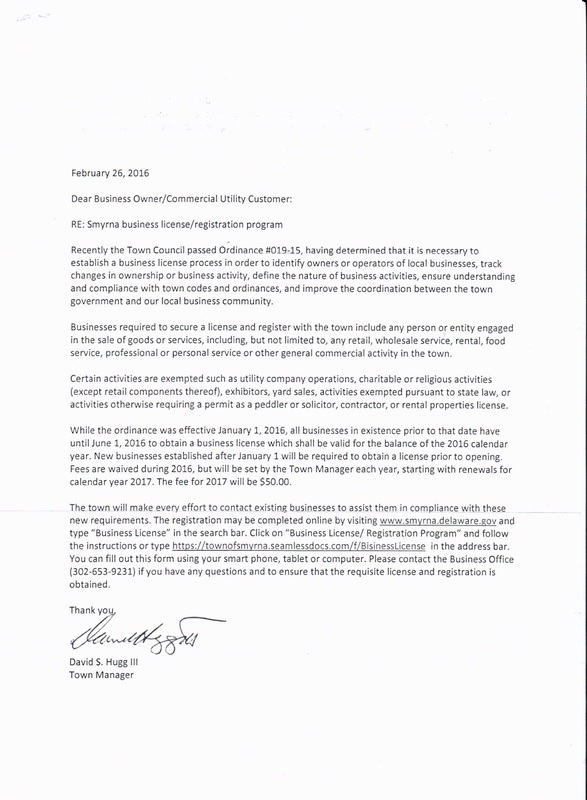 Just recently I received the following letter from Dave Hugg the Town of Smyrna manager: Business License requirement in the Town of Smyrna Delaware. Here are four things that should be noted here. 1. This form requires that I give out my home address and home phone number. 2. I must certify that the information that I am giving is true and correct. 3. 2016 for established business in the Town of Smyrna do not pay a fee. However in 2017 the fee will be $50. This is a yearly fee. 4. What is the Rational for this license? In my opinion this is a blatant privacy issue. In no way shape or form would I ever post my home address and contact information in a public forum. In no way would I give this information to a government agency. There is absolutely no reason for the Town of Smyrna to know where I live or what my home phone number is. So I did not give that information to them. Lets face it I love my customers and I love my work. However, when I am at home I do not want to work. It is private time dedicated to my family. Giving out that information would give the impression that you can come to my home and talk about work. If there is an emergency or other disaster at my place of business I have insurance that covers my losses. No need to contact me regarding anything that goes on when I am off. I will come to work during work hours and deal with it. As you can guess I am already in trouble because I put my business address down as my home address and my business phone number as my home number. Which means that I will not receive a business license. "Under no circumstance was there any intention of this becoming a revenue stream for the town. But we have to know who is here and what they are doing. 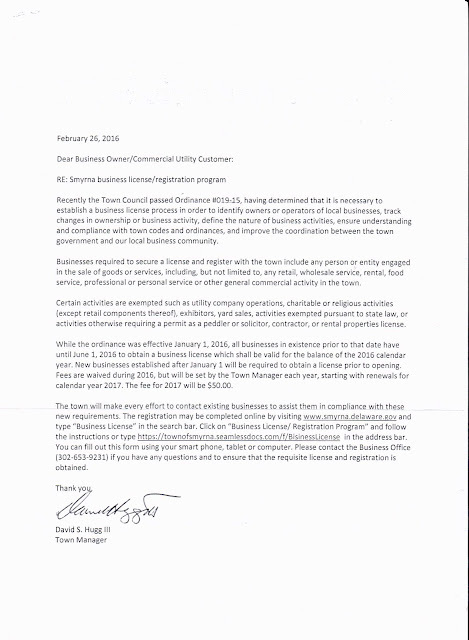 We have had situations where a business opens and we do not know they are even here because when utilities are requested it is in an individual's name not a business. We have had signs for businesses placed on buildings that not only do we not know about, but then a sign is placed on the building which is most definitely not in compliance. I understand that you may not be doing these type of things, but others do." So here is the scenario - Recession hits, Tax revenue declines, Town is short money to pay for services. Where do they get the money??? They get the money by increasing things that do not impact their chances of gettiing re-elected. So they will not raise taxes in a bad economy they raise the fees charged for services like licensing, permits, etc. We have seen it with the zoning compliance fee in the last recession. "But I can tell you for what it is worth the topic of a business license/revenue stream was discussed at length with Econ Dev/Bus Dev and Council and everyone of us state categorically this was not to occur. Obviously I can not speak for future councils as I only have 14 months left to serve but I can only hope that common sense will prevail." Yes Mayor, we can only hope. So hope in one hand and pee in the other and see which hand fills up faster. -enable our police department to have information as to who has a business in town"
Seems innocent enough. However we currently have departments that we pay taxes to maintain that do most of these jobs. The zoning compliance form identifies owners and operators of business's in town. The cost for this form is $75. This would also track changes in the ownership and or business activity. It also defines the nature of business activities. Hence the name 'Zoning compliance form'. There is a Code enforcement department that, believe it or not enforces the town codes and existing ordinances. If there is a non-compliant sign posted, our code enforcement officers should identify and proceed to enforce the town ordinances. What is really confusing is what does 'improve coordination between the town government and local business community' mean? Never has the Town of Smyrna ever, well in the past 13 years, tried to coordinate anything with local business'. What coordination is necessary? 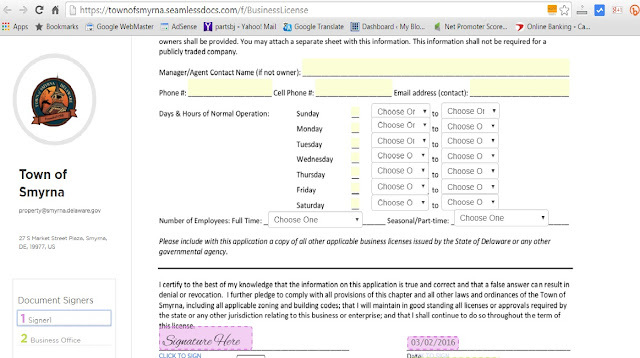 Why does our Police Department need to know who has a business in town? It certainly is not so they can do business with local companies. I have never done any business with any department of the Town of Smyrna. Ironically my company specifically sells to police departments, Fire Departments and EMS services and they all already have my phone number. If you have read my blog in the past, I do in fact support the Town of Smyrna in some cases, for example in my post regarding tax increases here is what I wrote . I specifically supported a tax increase to improve the services offered in town. 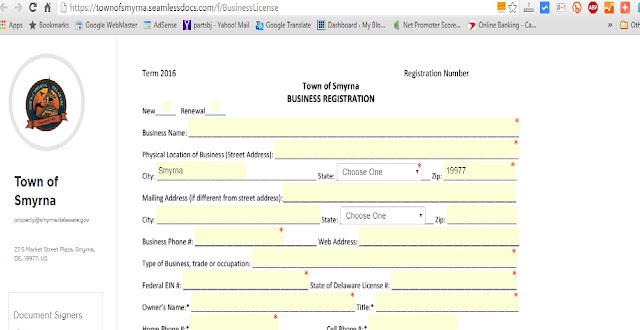 So I am not totally against a Business License requirement. I think that a Business License would allow the town to compile an accurate report regarding the economic climate in town which could be given out to prospective companies looking to move into town. This would not only bring jobs to town but would also increase the value of real estate as well. Being a property owner in town I fully support the idea of increasing property values. 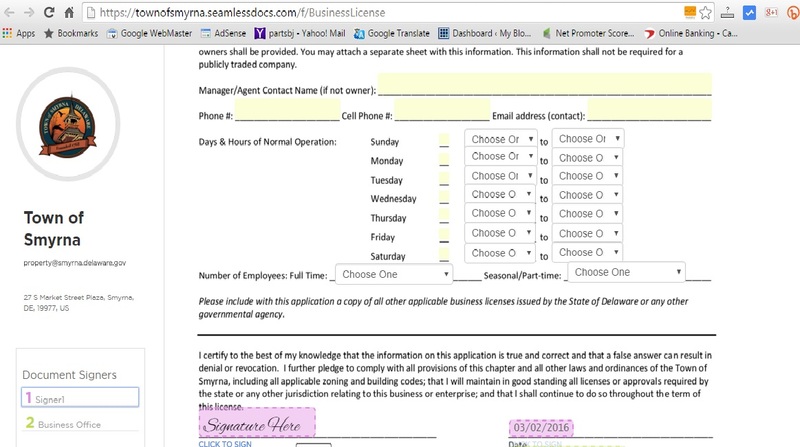 However this business license should not cost the business owner any fee. It should be free. It can still be mandatory. Where the Town and I disagree is in the type of information being collected and the open ended tax associated to the license. I would also add one last problem. How will the town know that a business is in town if they do not sign up for electric and they do not fill out the zoning compliance form? This new tax just adds to the law abiding business' expenses.